Often times, when we receive a negative review online, it’s nearly impossible to not take it personally. Most of our clients are independent business owners or operate community-focused non-profits, so not only are they passionate about what they do, it’s part of the fabric of their being. Having a personal reaction to bad reviews shows how passionate you are about your organization and that’s truly great to see. Unfortunately, in the world of business online, there is not much one can do to stop negative comments from being posted in public forums, especially if you are aiming to also gather positive ones. Don’t panic. Although a negative review can be scary, disheartening and maybe even feel like a blow to you on a personal level, one needs to remember that it’s how you react to the situation that really defines the organization. 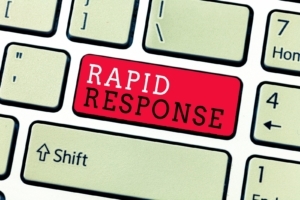 Respond quickly. It’s recommended that you respond promptly to the negative reviews. Most reports would tell you that people like responses within an hour (we’re so impatient these days), but 24 hours is more the average. Customize your responses. Don’t write the same thing over and over. Make each customer feel special. We recommend a “canned” response that you can customize for each situation. This response should include a sign of gratitude for the feedback, a request for the reviewer to call or come back by to discuss in person and a reminder of why you’re in business. Often times, a heartfelt, “I hear you, I’d like to talk to you and I’d like you to meet the person you impacted” can be enough for the reviewer to rescind or retract their review. Consider why they wrote it. Is there anything you can do to make the customer more comfortable in your store and welcome them back? Perhaps people who write about how expensive it is could privately be offered a 10, 20 or even 30% off coupon? Just take the time to consider why people wrote what they did and don’t dismiss it. Be open and honest. The customer will appreciate it and perhaps learn something in the process. Brush it off. At the end of the day, a bad online review – especially if you followed the recommendations above – is just that: a single drop in the bucket. Try to remember what went well that day, try to thank your employees for all their hard work and dedication, and do yourself a favor and brush it off. There are many blogs and resources online about how to react to negative reviews. Most of them will tell you the same things we’ve listed above. Negative reviews are not necessarily the worst thing. They can actually make the positive reviews stand out even more. They also showcase the reality of the world and make your organization appear to be a little more “real”.